132 pages, 8.5" x 11"
Would you be prepared to survive in the event of a complete breakdown of modern civilization? A man-made or natural global disaster could strand you for months, years or forever with no electricity, no water from the taps, no grocery stores, no city services and no government. Further, you'll be surrounded by countless others who didn't prepare - the very same people who mock survivalists by calling them paranoid pessimists and worse. But survivalists are the ultimate optimists. They believe that they will succeed - no matter what happens to the rest of the world - if only they can assemble the right supplies and learn the right survival techniques. 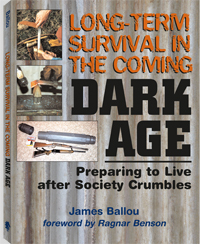 Author Jim Ballou introduces you to the essential skills and mind-set you will need to survive a complete, long-term shift in the way the world operates. He tells you what items you need to assemble now and what skills will be priceless later. Learn how to assemble a survival workshop, recycle and salvage everything, develop survival bartering skills, prepare and store caches, and much, much more. More than a blueprint for bad times ahead, this informative guide may inspire you to attain a new level of self-sufficiency. As far back as James Ballou can remember, his interests have included survival activities – hunting, fishing, exploring, treasure hunting, backpacking, shooting, making and using tools, and just plain improvising. The author of dozens of magazine articles on various subjects, he also served four years in the U.S. Army as a paratrooper with the 82nd Airborne Division. This is his third book for Paladin Press.